Mia Nicolosi of St. Thomas, beat the U.S. and British Virgin Islands’ top Optimist sailors, her brother Teddy and Rayne Duff—something she has never done—in the BVI Dinghy Championships that wrapped up two days of sailing Sunday in the Sir Francis Drakes Channel, by capitalizing on the light breeze. Racing out of the St. Thomas Yacht Club, Mia finished the competition with 18 points and had only one third place finish to go with three firsts. 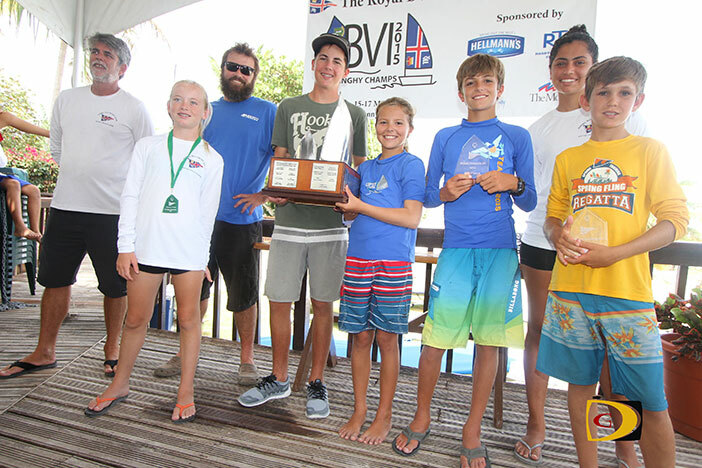 Teddy was second with 19 and Duff of the Royal BVI Yacht Club was third with 24. Green Fleet: 1. Katherine Majette, St. Thomas, 31. 2. Anya Reshletiloff, BVI, 34. 3. Ryan Lettsome, BVI, 38. 4. Max van den Driessche, St. Thomas, 39. 5. Winborne Majette, St. Thomas, 88. 6. Zahrria Thomas, St. Thomas, 89. 7. Hanna Tonin, St. Croix, 93. 8. Robbie Richards, St. Thomas, 94. 9. Nicolas Haycraft, BVI, 96. 10. Tanner Krygsveld, st. Croix, 101. Red Fleet: 1. Teddy Nicolosi, St. Thomas, 19. 2. Victoria Flatley, St. Thomas, 53. 3. Julian van den Drisseche, St. Thomas, 64. 4. Atlee Kohl, St. Croix, 70. 5. Gillian Perrell, St. Thomas, 108. 6. Rider Odom, St. Croix, 124. Blue Fleet: 1. Mia Nicolosi, St. Thomas, 18. 2. Rayne Duff, BVI, 24. 3. Mateo Di Blasi, St. Thomas, 61. 4. Lake Sanford, St. Croix, 90. 5. Matthew Dale, St. Croix, 108. 6. Kyle Roost, BVI, 132. 7. Dawson Kohl, St. Croix, 137. Triple Crown: 1. Rayne Duff, BVI, 49 points. 2. Julian van den Driessche, St. Thomas, 144. 3. Lake Sanford, St. Croix, 147. 4. Teddy Nicolosi, St. Thomas, 166. 5. Atlee Kohl, St. Croix, 173.